Best holiday home, great amenities, superb pool and ample room. Would definitely recommend this place to all! My bridesmaids and I stayed at Nirvana over my wedding weekend. Our stay was amazing, so peaceful and no stress whatsoever. There was plenty of room for the hairstylist and makeup artist plus all of us to get ready. The location is just perfect. It was a 3-minute drive to the wedding venue and also hidden from the hustle and bustle. I would recommend Nirvana to anyone wanting lovely accommodation and friendly helpful owners. I will be back Rekha & Shekhar. A great place for a group celebration. Secluded and private. Lovely areas to be together or to enjoy solitude. Native wildlife and birds amazing as well as beautiful gardens and landscaped areas. Rekha and Shekhar, your home and property were a perfect place to enjoy our special getaway weekend to celebrate my daughter’s 40th birthday. All the best for the future success of your beautiful property as a getaway for groups such as ours. Kind regards. (The) Place was amazing with plenty of space for all our family. Everything was clean, well set up with notes on how to use everything all over the house. Great position in the Montville hinterland. Speaking on behalf of all of us: What we wanted was a spacious, interesting retreat and what we got was beyond our expectations. We loved the sprawling nature of the house and surrounding property. The wildlife was amazing and quite exciting for the kids. You have done a fantastic job in creating an inviting home away from home. We had a fantastic stay here. Thank you for creating such a lovely place.. We will be back soon. We had an amazing peaceful stay. Thank you, Rekha & Shekhar. The ambience of the house made us feel at home. Love the peace and serenity around the surrounding. Rekha & Shekhar have been great hosts. We were a group of 4 families at their property and Rekha & Shekhar made all the arrangements to make our stay enjoyable. It is fully furnished house and location of this property is just awesome with few minutes away from Kondalilla falls entry point. If it’s a good day, you will get to stay in clouds. That’s the beauty of this location. Would love to go again! Thanks, Rekha & Shekhar for being proactive and responsive as well. In the heart of a beautiful area, everything at your ‘doorstep’. A well-equipped house with everything one could need, very peaceful lush surrounds. Thank you, Rekha & Shekhar. We had the most amazing weekend at Nirvana. It was the venue for our wedding and everything was perfect- The house and surrounds were beautiful, relaxing and the facilities were great-everything we needed was right here! !Rekha and Shekhar were great hosts who made sure everything ran smoothly for our stay. Shekhar- thanks for all your help and communication. You made everything very easy and comfortable and we really appreciate it. Will definitely recommend Nirvana as a special place for a wedding or a relax: Will definitely be back! Quiet place with majestic views and full amenities. Shekhar and Rekha were great hosts, very quick response, well maintained home with all the amenities including the swimming pool which kids enjoyed a lot. Nirvana home was the best secluded house in the amazing nature surrounding. Awesome house. Very private. Lovely grounds in a great location. Within walking distance to some awesome bush walks. Great hosts. Excellent communication. This house is large, peaceful and private and everything about our stay was easy, welcoming and professional! The view makes you feel like the only place for miles. A perfect spot for a weekend catch up between a group of old friends. Being so close to the (Kondalilla) falls walk was a real bonus. Would definitely stay here again. Thanks! Thanks for four wonderful days in beautiful, peaceful Nirvana. Once again, we have had a fabulous get-away. Spacious house with everything you need. Even great for children as there is entertainment for them too. Beautiful location and great views. Home away from home and lovely with the fireplace in winter. Such a beautiful house-we can’t believe how quiet it is. The birdlife is amazing- especially hand-feeding the kookaburras. Our quilting group enjoyed our long week end. Thanks so much for accommodating our group at such short notice. We had such a special and memorable night together in a wonderful home. Great atmosphere. Well appointed. Rekha and Shekhar’s place was absolutely lovely. From the entrance to the interior decorations, big patio with tables and chair overlooking Flaxton. Lovely grass area around the back with a clear view of the sky for star gazing. Property is a 5mins walk to Kondalilla National park and waterfalls, short drive to cafes, vineyards and other local things to do. Definitely recommend this property and would very happily stay here again! My mum, sister, uncle, friend and 9-week-old beautiful baby had the pleasure of staying at the beautiful Nirvana. We were amazed by the beautiful surroundings and peaceful atmosphere. The house was very comfortable and gorgeous. We had a beautiful weekend away celebrating the marriage of my brother Nathan and Grace. Thank you! Nirvana was absolutely beautiful. The surroundings are stunning. The house itself is exactly as advertised. The house is very spacious, all bedrooms are generously sized, huge kitchen, multiple entertaining areas and beautifully decorated. We stayed at nirvana for a wedding, it was an easy drive from Brisbane and extremely close to our two venues. We had a wonderful stay and look forward to returning in summer to enjoy the pool!! Thank you for sharing your beautiful property. We had a lovely weekend and what an amazing spot. Great place to stay lovely and quiet. Close to Montville. Awesome property and exceptional hosts! Highly recommend a visit to this Nirvana house in the Sunshine Coast hinterland. Wonderfully quiet getaway surrounded by nothing but beauty. An amazing property in the hills. It is very quiet and private, but with a lot of space for a weekend away with friends. We had a lot of fun staying at Nirvana. Excellent location with the water falls just a short walk from the house. We just had the most amazing weekend celebrating our engagement at Nirvana at Montville. We can’t thank our hosts, Rekha and Shekhar enough for the amazing hospitality we experienced and also for letting us use your beautiful home for such a special celebration. We can’t wait to be back! Several of our guests mentioned they would like to book their own weekend getaway at the home as it is just so peaceful and lovely. The minute we stepped through the door, we just felt so at home. 5 stars! Thank you so much for allowing us to stay at Nirvana – the happy young married couple are overjoyed and everything exceeded their expectations. the wedding and everything else was perfect. We are having a wonderful time in Montville and we thank you! Thank you so much for a beautiful stay in an amazing home. Our friends and family joined us for our wedding. Perfect! Hope to see you again. Best Stay Ever! Best hosts ever! Such an amazing house-Can’t wait to return. Thank you for the wonderful hospitality. Your beautiful retreat made for a relaxing and fun girls weekend escape. We hope we can manage to plan another weekend in the not too distant future. Thank you for welcoming us to your lovely home. We enjoyed our stay and will definitely recommend Nirvana to friends and family. The retreat is well equipped, spacious and very relaxing. Looking forward to staying here again. Kind regards. Rekha and Shekhar’s place was the perfect getaway for our group of 10. It was so relaxing swimming in the pool, wandering the 3 acres of immaculate gardens and lawns and lounging on the decks taking in the stunning views. There was plenty of space and the house was clean and comfortable. Only a short walk to cafes and the rock pools at Kondalilla Falls as well. I can’t recommend this place more highly! Thanks again for letting us stay in your wonderful mountain retreat! It was definitely one of the best Airbnb experiences I’ve had! The view was spectacular, and the pool and amenities were perfect! I’m definitely recommending this to friends and relatives. Beautiful house in beautiful natural settings. You really get the feeling of Australian nature here. The house located near a wonderful national park with beautiful hiking trails, waterfall, and a natural swimming pond above the waterfall. This house is well maintained, clean, cozy, with a nice style, and a large veranda. Great for a large family. Shekhar was very easy to communicate with, super helpful and understanding. Great host! Thank you. I love this home. So private, well equipped and very spacious. The views and tranquillity are second to none. The pool is a great way to cool down in the heat of summer. We loved the location and will be sure to come back for a cosy winter getaway mid-year. Thanks for your warm and welcome hospitality Rekha and Shekhar. Dear Rekha & Shekhar. Thank you so much for another wonderful holiday at Nirvana. My friends and I have enjoyed a lovely, peaceful retreat in your gorgeous setting with beautiful gardens and amazing views. We are looking forward to our next girls weekend at your beautiful Nirvana. We enjoyed our stay at Rekha and Shekhar’s place. The location was great and it was nice and secluded. The quality of the bedding was a particular highlight Would definitely stay again! It’s so close to town and some beautiful walks but if you don’t want to do anything other than just lounging on the day bed and gazing out at the garden from the front, or taking in breakfast with the birds and valley views out the back, this is the place for you. I was so impressed with the kitchen, … everything was there. I never found myself wishing something was there that I needed and I’m a bit of a pedant when it comes to cooking! I can honestly say this is the nicest place I’ve ever rented for a family holiday. Will we be back? Hell yes! Hi Rekha & Shekhar: We had an absolutely lovely weekend staying at Nirvana with 4 other mums and our teenage daughters. It was a great place to unwind and hang out with our girls. The house was beautiful and so well equipped – we all love cooking and it was probably the best equipped holiday house kitchen I have used. it was lovely having so many different places to sit and chat. Highly recommend this for a great getaway. Thank you – so glad we found Nirvana. We had the perfect stay at Nirvana. Our party of 8 had plenty of room with comfortable bedding. We loved the lounge with the open fire, bar & Bose sound system enjoying great conversations in a very relaxing environment. Not far from the gorgeous town of Montville meant we were only minutes away from all the beautiful shops, cafes & restaurants. The gardens are gorgeous and just short stroll away from the waterfall! Loved this place and we will return. The owners were great to deal with as well! Spot on, highly recommend! Had the best time in this beautiful house. Thank you for a lovely place to spend the weekend and relax-we really enjoyed it! We also had great fun playing “Just Dance” on the Wii and we highly recommend High School Musical to anyone staying: it was a great throwback! Just had an amazing weekend here with the best of friends. Fantastic location, beautifully decorated and we did not want for anything (except for running out of red wine on the last night!) Everything was beautifully presented and we felt like we were in Nirvana. Thank you so much to Rekha and Shekhar. We highly recommend this beautiful home and will be back ourselves. We were greeted by the best hosts. From start to finish their hospitality and beautiful home (absolutely stunning views and so well presented) made for such a memorable weekend. Highly recommended. Nirvana is an excellent place to getaway for a weekend. Great place for the whole family. We enjoyed watching the stars at night from deck. There’s limited mobile coverage which really helps turn off from the outside world. It’s very close to Montville shops where there’s a good selection of restaurants and boutique shopping. Lastly, the hosts are one of the best I’ve had the pleasure of interacting with on Airbnb. They are very quick to respond and the check-in process was so easy. Excellent place to stay for a great time away from the city and suburbia. Thank you for letting us stay at your holiday house. We really enjoyed the quiet, relaxing time we had there. Our family had a great time at Rekha and Shekhar’s place! We all enjoyed local walking trails, the pool, playing games and the beautiful surroundings. Montville village is just a short drive away. We all had a comfortable stay and had everything we needed at the house. Thanks for sharing your beautiful home with us! We received an email in advance and a phone call after arrival to ensure that everything was clear to us and that there were no problems. The house is stunning and has plenty of space for seven adults and two children (2 and 8), both indoors and in outdoor sitting areas. Kondalilla Falls National Park is a five-minute walk away and we couldn’t’ have wished for a better place to spend a family weekend. Thank you so much Rekha & Shekhar for letting us stay in your beautiful house. Thank you for a wonderful stay. We all (aged from 2 to 60+) had a wonderful time and hope to come again. So handy for walks too. We could not have asked for a better setting for such a lovely weekend. Rekha, Shekhar-You have done an amazing job here and we are all very thankful to experience what your hard work has gone into. Rest assured-we will be back! Awesome Weekend-the house is absolutely gorgeous. Thank you for helping us getting to reach the Nirvana (sic). Cheers from all of us! • This is such a beautiful place. It is so peaceful. We have truly enjoyed our time here. I look forward to coming and enjoying it again sometime. You have thought of everything! The time away from family has been truly amazing. Your beautiful home was everything we hoped for. I loved the décor and everything your home offered. It’s so peaceful and beautiful here and we would love to come back at some time. Thank you so much for everything. Dear Rekha and Shekhar: What can I say – it was “home away from home”. I wish we could have spent more time enjoying your beautifully presented home. It was our son’s wedding on the Saturday in Maleny and I am very particular at all times about where we stay and “Nirvana at Montville” did not disappoint. The spacious home was warm, welcoming and very comfortable, with several areas to relax, indoors and out. My family who stayed with us from Sydney and Melbourne were also very impressed with the house. So relaxing and peaceful yet so close to Montville. I am sure we will be back! Regards. Nirvana is an absolutely beautiful home and helped to make the time as a family to celebrate our daughter’s wedding magical. Rekha and Shekhar were lovely and welcoming from the start. Immediately answered any questions we had and were very helpful providing all information needed before we went. The house is exactly as the pictures portray and the surrounds are absolutely stunning. I would highly recommend this house. Great stay at NIRVANA. Beautiful Property. We enjoyed 2 nights at Nirvana for my wife’s birthday and we could not be more happy with the whole experience. So close to many areas of interest in the Sunshine Coast Hinterland yet it felt so secluded. From the moment we entered the property’s grounds, you just felt relaxed and that’s exactly what we were wanting. The house was amazing with large bedrooms, the Buddha Bar with a fireplace (great place to end the nights), large deck areas and 3 acres of beautiful landscaped gardens and fruit trees the kids loved exploring. Walking distance to Kondalilla Falls, which made for a great morning. Definitely worth doing. 5 minutes to the centre of Montville and also not too far was Flame Hill Winery that we visited on the way home. 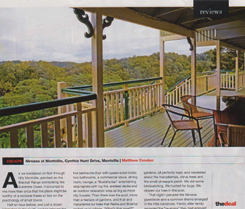 A really enjoyable country getaway that I couldn’t recommend higher. The owners were great and very quick with reply to a request we had. Also gave a courtesy call on the first night to see if everything was OK and a few ideas for the next day. Thanks for a great stay! Beautiful home and such accommodating hosts! Fabulous house for a family gathering. Plenty of space & room. Great weather, great home. Lots of fun. Had a wonderful, peaceful long weekend. A lovely house with everything you could need. Thank You! Thank you for sharing this amazing home. We were very comfortable and felt absolutely welcome. Such a beautiful & relaxing place. Here for a wedding with some of our very best friends. We couldn’t have imagined a better place to stay! Our baby has just had one of the best weekends of her life! Thank you so much, we hope to be back again sometime. Thanks for welcoming us to Nirvana. Was a great relaxing time that I’m sure will be relived again. What a gorgeous environment to create in! So relaxing; beautiful house and stunning surroundings. Thank you for all the lovely details and thoughtful additions in this very convenient home. Great place, great pool, lovely views, lovely décor-great for a 60th Birthday Celebration! Thank you for allowing us use over the Christmas period. What a memorable holiday for us all-Thank you!! It was a great experience and the views were stunning. Thank you for the use of this lovely home in such tranquil settings. We all felt that it was the holiday home we all wish we had! See you again, Nirvana! Absolutely surreal; waking up to the sound of birds singing, a visit from Mr. Kookaburra himself, amazing bird life…WE love it. Many thanks. Words can’t describe the beauty and Zen feeling of this place: the most relaxing and enjoyable holiday ever. We’ll come here again and again and recommend it to others as well. Amazing place! Amazing views! And Amazing facilities at Nirvana. Felt like home away from home. We had a great time here. Enjoyed every moment and every part of the house, front and back verandas and lawns. The sunrise and sunset views from the back veranda were amazing. We had an amazing holiday @ Nirvana. Enjoyed cooking in your home like kitchen and very nice views over the sunset sitting in the veranda. Full credit to our hosts Rekha & Shekhar. Amazing stay. Beautiful place to relax and get ready for our wedding. Highly recommended! Good Zen, feeling tranquillity & peace of mind. Love the décor down to the finer details. Feeling unconditional love, peace and joy! Thank you for sharing your lovely home with us. It has been a tranquil and relaxing break. We had a wonderful time here. The house has everything and is very peaceful. We’d definitely stay again! What a beautiful spot and thank you for such a clean and well maintained property. Didn’t want to leave! Fabulous stay! Will highly recommend and we will be back! Hello Rekha and Shekhar. We had the most wonderful stay at your beautiful guesthouse and we will be recommending it to our friends. The wedding was all that we had hoped and the valley around the Obi Obi Hall was electric green in response to the rainfall the area had a couple of weeks ago. A breathtaking backdrop in all of the photos. We know you are very proud of both your hospitality and the presentation of Nirvana. We had such a great time at Nirvana and plan to gather there with friends at a time in the near future. Our stay at the house offered us the opportunity to host a couple of lovely gatherings of family on your spacious decks looking out over the beautiful countryside. Just beautiful. Looking forward to when we next stay. Fond regards. Wonderful house, private location. A good place for group outing and family holiday. The decoration and facilities are wonderful. The bar area and kitchen are well designed for large group of people. Love it so much! Definitely will book again! My husband, myself and some close friends from interstate & overseas recently stayed in this beautiful house. We are amazed at how beautiful it is. We stayed in Nirvana for a long weekend while attending our son’s wedding. We all agreed that it was the perfect house in the perfect location. Its size, decor, attention to detail, tranquil surrounding grounds and proximity to both Montville and Kondalilla Falls was much more than we had expected. We’ve just loved it here. Thanks so much for sharing your house with us. Sorry I didn’t get to meet you. We’re very sad to leave Nirvana. We are already planning a reunion there sometime in the future. Highly recommended! Thank you, again. Our family really enjoyed our stay at Nirvana. We will keep coming back. Many thanks, Shekhar & Rekha, for sharing your wonderful home with my family. We really enjoyed your home. It was clean and beautifully presented. Lovely, relaxing peaceful house. So much room, excellent weather and those glorious verandas! Nice seeing and hearing all the birds. We are hoping to come back and stay for a longer period. Again many thanks for your prompt and pleasant communications and your willingness to be flexible, it was greatly appreciated. Regards. Thank you so much for a week in your beautiful home. Five days spent relaxing with our overseas family-truly well spent. It is so inviting to relax around the fire and share meals in your fabulous kitchen. A holiday we will always remember. We loved the ambience of Nirvana. So tranquil. Such beautiful surroundings and a beautiful home. It’s a wonderful place. !!! I will never forget the reaction of our 16 year old niece who jumped for joy when we first entered the property and kept saying “Is this all ours”. Our overseas visitors still talk about it. They are coming back next August and want to return. The peace and serenity together with the ability to be able to have your own space when there are two families staying as we were. Thank you again for opening up your lovely property to us. We will be back again soon. What a lovely place to spend time with great friends. We loved everything from the misty rain to the low clouds swirling around the tree tops. Many happy hours spent around the fireplace making more fond memories and testing our knowledge with Trivial Pursuit. Everything you could ever want was here. We enjoyed the music and the bird songs. Will remember this short stay with a happy relaxed feeling. The serenity is all around you here. Thank you for sharing your house with complete strangers! A Peaceful Paradise. Nirvana is lovely. It is a place to relax and enjoy the mountain top surrounded by bushland and birdsong while in the comfort of a warm, cosy home. There were 5 couples in our group and there was plenty of room for us all to sit and enjoy the serenity by the fireplace or out on the verandas. The home has it all, great kitchen with everything you need to entertain a crowd. Comfortable bedrooms, spacious bathrooms and laundry. Short drive to Montville Village and short walk to the Kondalilla Falls. Highly recommended!! Nirvana was absolutely wonderful. We thoroughly enjoyed or stay for our family gathering to celebrate our niece’s wedding-which kept us very busy-however, peaceful mornings on the verandah & the late nights by the fire were brilliant. Everything we needed was provided. And despite being a full house and a very busy time, the house/verandah & grounds provided plenty of opportunities to get away from it all and relax. We had a thoroughly enjoyable stay and would highly recommend this accommodation. Thank you so much for allowing us to share your wonderful house. Excellent Property. We thoroughly enjoyed our stay at Nirvana. The house is very well set out and very comfortable for a large group. The location is very private and beautiful. Very convenient to the shops of Montville and Kondalilla Falls. Fabulous accommodation would definitely come back and recommend to others. Beautiful home, very secluded and fitted out well for a large group. Very relaxing. We had an awesome time! Thank You! Lovely serenity. Had a lovely Girls’ Weekend break Annette. March 2015. Enjoyed our fourth stay at Nirvana. As good as ever. Peace & serenity and unwind.-Kindy Girls. March 2015. The house is very homely and well supplied. Really well supplied kitchen – perfect for a big family gathering like we had. Plenty of seating inside and out. Close to Kondalilla Falls. Very tranquil. We had a great weekend. Thank you. Dunn Family. February. 2015. Thanks for providing a fantastic and beautiful place for our visit. We all had such a relaxing couple of days and we definitely wont forget our time here. Louise. North Ireland. Dec. 2014. Thank you for such a lovely place to stay and celebrate our mother’s 80th birthday together. So many special places and special memories have been made in Nirvana. Heather Rossberg. John & Kathy. Annette & Claude. Jennifer & Gerry. Novemebr 2014. Thank you for such a beautiful home. It was such an amazing experience to be able to spend time with all my family before my big day. This place was awesome and the views spectacular- (and that) is an understatement. Thank you for being so understanding and easy to deal with: your daughter, Noel, has been amazing. Thanks again. Elaine. October 2014. Just fantastic experience this house has been. We totally enjoyed all the comforts and surroundings of this area. Thank you so much for sharing. We, the Aorangi Fiege family will always remember this lovely home. Thank you so muck. Margie. October 2014. We wanted to have a Hen’s weekend that was memorable and having it at Nirvana was perfect. From the spacious kitchen to the lovely outdoor areas the bride to be surrounded by her friends was delighted. In fact we stayed in for our meals rather than leave this beautiful property. Highly recommend to any other families or groups looking for space and comfort. Ann. September 2014. Such a beautiful home! Worthy of its name! It had everything we needed. We loved our stay here and enjoyed the wonderful views. Thank you for having us. Will & Bec August 2014. A beautiful house for our small family wedding. Very peaceful & tastefully decorated. Ross & Glenys. August 2014. Absolutely beautiful house! Relaxing with a family feel. Had a wonderful time. Matthew & Priscilla. August 2014. 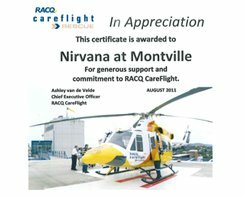 Outstanding and Welcoming We really enjoyed our stay at Nirvana at Montville. The place was outstanding and I felt at home immediately. We were a large group and Nirvana catered to all our needs,plenty of hot water and great heating.The owners are the nicest people and nothing was a problem for them. I was only sorry that we only stayed for two nights. I would love to return in the summer months and enjoy the outdoor pool and deck area. I would highly recommend this property. Terrey. July 2014. What a weekend! Absolutely fantastic! Thank you so much for this wonderful house and two night stay. We seven ladies have felt incredibly comfortable and oh so relaxed. It was exactly what we needed for a break from the busy-ness of everyday life. We have already recommended it to friends and would love to come again. Thank you. Kara, Susan, Helen, Kellie, Angela,Kellie & Cardine. July 2014. Thank you so much for this lovely home that we have been able to use. We have relaxed, had fun and really enjoyed your fire place: We certainly needed it! Annie & Patrick. July 2014. Thank you once again for a lovely weekend away from our busy lives in Brisbane. This is now our 3rd time staying in Nirvana and we have no hesitation in recommending this wonderful home away from home. We are already planning our next weekend here. Regards. Stephen & Elaine. July 2014. Dear Rekha & Shekhar:We just wanted to say thank you for everything our stay in nirvana was fantastic. The house was perfect for our hens yoga retreat weekend,it was so calm and serene with such a lovely homely feel. We all enjoyed the fireplace it just makes it in the cold weather. And thank you again for being so helpful with all the other organisations with the yoga etc it was a great help. To anyone thinking of staying here I would highly recommend it everything you could possibly need is provided in the house the beds were awesome really have nothing I would change it was 10 out of 10 for us. Can’t wait to plan a trip in summer to use all those cool outdoor areas.Thanks again Jillian. Namaste. June 2014. AWESOME ! For my 30th birthday, I chose to invite my family and friends to celebrate at Nirvana. This beautiful house has spellbound us all ! We love being here so much that we don’t want to leave ! We will take so many great memories back to Melbourne, Brisbane & Noosa. Namaste: Karys. July 2014. We enjoyed our two days stay in Nirvana. All the facilities are beyond our expectations.Thank you for giving us the opportunity to stay at Nirvana. Taking good memories with us. Tom & ShinyPaul & Molly & Children. July 2014. The house was nice and clean and the beds very comfortable. Thank you once again for the early check-in and out this made the movement of people a lot easier. Will definitely recommend Nirvana to anyone that needs a place to relax away from the rush of city life. Bev. June 2014. What an amazing place! We couldn’t fault a thing about it & created some great memories with family. Thank you- Michael, Carolyn, Andrew, Roxanne, Ellen & Lincoln. Oct/Nov 2013. Had a fantastic time with my family for my 60th birthday. House was amazing-so clean and plenty of room. We had a great night around the toasty and warm fire, singing and enjoying lots of laughs and drinks. Gay, Justine, Laura, Lori, Trisha, Emily, Mel and Debbie. August’13.